Guys, this is sort of incredible. We told you just yesterday that Amazon had managed to get a shipment of AirPods in stock, and that they were available with free same-day Prime shipping in many parts of the country. Well guess what: it must have been a pretty huge shipment, because they’re still in stock despite the fact that hundreds of our readers bought them! 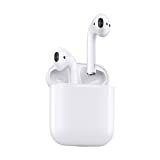 You can buy yourself a pair on Apple’s site and wait until sometime next week for them to arrive, or you can buy the Apple MMEF2AM/A AirPods Wireless Bluetooth Headset on Amazon for the same price and get them as soon as TODAY with free Prime shipping. The choice seems pretty easy.